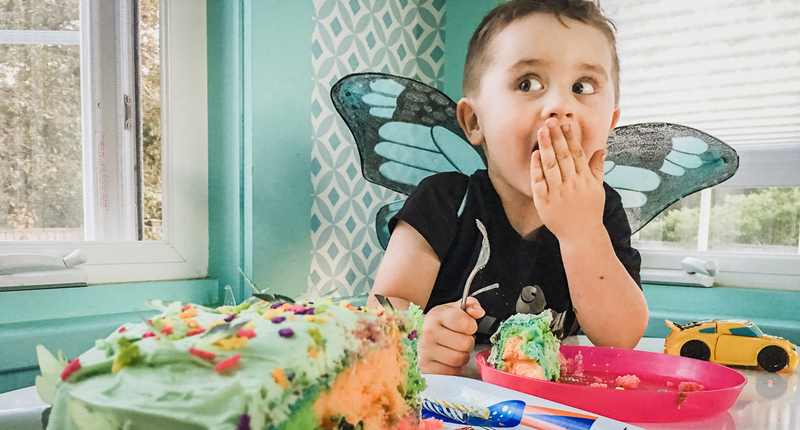 [Image Descriptions: R2 celebrates his third birthday by eating a rainbow cake covered in butterfly decorations while wearing his own blue butterfly wings.] The rest of the images in this post are book covers of titles referenced in the post. In this post: Our favorite collection of birthday-themed books for infants through kindergarten. Celebrating 3 years of Books For Littles! In honor of the 3rd birthday of Books for Littles, here are the birthday-themed books we’ve enjoyed most through the years. Captioned age ranges are for when my sons enjoyed each story in anticipation of an upcoming birthday or a friend’s birthday party. The following stories center around cultural milestone events that are not-quite-birthdays, but significant birthday-ish events. Most of them do double-duty in colluding with big siblings for the pomp and attention a new baby attracts, which is helpful for validating envious feelings while also giving older siblings a sense of control and inclusion preparing for the big day. ‘Henry’s First Moon Birthday‘ centers on big-sister Jenny in the preparation before her baby brother’s First-Moon Birthday. She and her grandmother prepare food and decorations for this Chinese tradition. ‘A Song For My Sister‘ features Mira’s conflicted feelings surrounding her baby sister’s Simchat Bat (Jewish naming ceremony) and her experience – both challenging and hopeful – with the changes in her family. [R2’s top pick from ages 1-3.] From 12-18 months, R2 was obsessed with all things birthday-cake related and he asked to read ‘Who Made This Cake?‘ every night. Both he and his older (age 5) brother love finding tiny details of how the trucks work and how the construction workers (roughly half of which are female!!!) work to build a cake worth remembering. ‘Happy Birthday, Bunny!‘ isn’t particularly interesting as a story, but the illustrations are devastatingly cute and helpful if you’re preparing a tot for what to expect during a traditional North-American secular birthday party. Stories like this are great for anxious kids who like to be prepared before new experiences. (Q’s top pick from 2-3). Like many of Oxenbury’s characters, the little boy in ‘It’s My Birthday‘ is flawed and realistic and Q finds this validating. He particularly loves that the main character neglects to say ‘please’ – so Q could can correct the language as I read the text. After adding our ‘please-es and ‘thank you-s’ to the story, the sweet (but mercifully short) repetition ends with a tiny bit of suspense and a simple lesson in sharing and appreciation. ‘Bulldozer’s Big Day‘ was perfect for the peak of Q’s truck obsession around 2-3. Even for his 4th birthday, he loved the suspense of Bulldozer’s excitement, disappointment, and the big twist at the end. As is typical with truck books, you’ll have to take a few liberties swapping gender pronouns, as all the characters in the book are male (Bulldozer & Roller are gender-neutral). ‘Whopper Cake‘ is a long-time favorites of both kids. Not really much to do with birthdays, but it’s silly and imaginative and perfect for that stage when kids love the extremes of huge things (generally around 3-4ish) and really, we all love fantasizing about massive cakes so big they need to be baked in the bed of a pickup truck. ‘Xander’s Panda Party‘ is an adorable (albeit unrealistic) story of compromise and inclusion. Silly stories like this are helpful to explain why everyone we know can’t be on the guest list for a birthday party, but allow for us to imagine what-ifs. It’s also a helpful book to touch on the idea of discrimination (by species) and exclusion – while the story doesn’t address the idea directly, we’re called on to consider: where do we draw the line on who is invited, and who isn’t – and what’s a fair way to do it? Limiting guests isn’t an issue for our family (Our policy: Third birthday parties get three guests, and so on…) but it’s worth talking about. ‘A Fire Truck Named Red‘ is only tangentially related to birthdays, but we love reading this story of a grandfather’s hand-me-down gift to his grandson. Although initially disappointed to receive a rusty old toy, the boy and his grandfather fix it up together as grampa recounts his old adventures with the truck. My boys are delighted with the meaning behind each ding and scratch, and understand how priceless ‘Red’ is by the end of the story. ‘Pancakes for Findus,’ AKA ‘The Birthday Cake‘ (same exact story, different titles designed to appeal to US readers) are from Sven Nordqvist’s series of a doddering old man and his precocious talking cat. This is our family’s favorite series and each book is beloved. Findus & Pettson’s banter is heartwarming, charming, and witty, and they fit within the detailed, ordinary-yet-fantastical illustrations perfectly. Every single one of these books is something I’m excited to hand down to my grandchildren one day. I wish I could recommend the ‘How Do Dinosaurs…‘ series, with illustrations that hilarious but feature terrible examples of what NOT to do – but my boys use these cautionary tales as inspiration and it doesn’t work for my rambunctious little earthquakes. So I was delighted to find ‘If A T. Rex Crashes Your Birthday Party,’ featuring a similar humor, but without the troublesome inspiration for misbehavior. Its centered around a traditional secular North American birthday party (party games, pinatas, etc.) so might not make sense for kids who celebrate differently. While ‘Marisol McDonald And The Clash Bash‘ isn’t the most amazing story, it’s rare to find books featuring multiracial families. Marisol can’t pick just one theme for her birthday, so she decides to merge them all together. Works for birthday party planning, otherwise you can skip it. Carmela Full of Wishes – the excitement of new responsibilities as you get older, and that encroaching feeling that the world is a little too big for you to take on yourself. Happy Birthday To You – Yeah. I know Dr. Seuss was racist. But you know they are going to come across this book at school or whatever, and you might as well read it together and unpack how a man who creates such fun books can have problematic views. Did you enjoy this article and learn something new? Consider supporting my work on Patreon, so I can continue to help parents & educators like you raise the next generation of kind & brilliant leaders. For as little as $1 a month, you can get access to exclusive bonus content, sneak peeks, and free resources you can’t find anywhere else.